Daniel O’Donnell sings some of my favourite gospel songs. Apparently he is very famous around the world, especially in Ireland. I recorded this gospel song on my LP record back in 1972 in Johannesburg, along with next two gospel songs. A friend on Facebook said she never hears this song in church anymore, so maybe she should listen to Daniel O’Donnell. In church yesterday I was talking to a lady who grew up in Ireland, and I was telling her that I planned to put a section on my website of an Irish singer. She got all excited and asked what his name was. 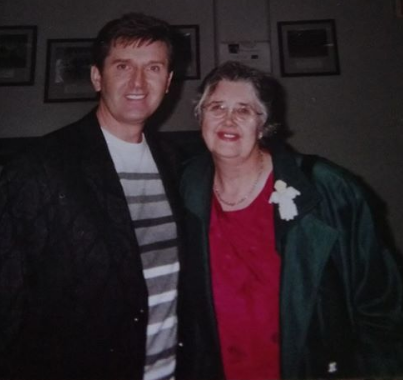 When I said “Daniel O’Donnell” she got even more excited and said she has a few of his gospel records. She said she went to one of Daniel O’Donnell’s concerts in a nearby city and said he always ends his shows with a gospel song. So that is encouraging. She also said he is taking a break from singing because his wife has cancer. So last night I prayed for his wife. Then this morning before going on the website, I read about them and discovered that she is already healed. So that is good news! Anyway, we have had lots of healing experiences.